Watch Dr Emma Smith talk about the Bodleian’s First Folio. Without it, half of Shakespeare’s dramatic work would have joined the scores of lost plays by other writers from the Elizabethan and Jacobean period. We would know nothing of heroines such as Rosalind, or Viola, or Hermione, or Cleopatra. We would never have had “Friends, Romans and countrymen, lend me your ears” (because we wouldn’t have had Julius Caesar) or “Double, double, toil and trouble” (no Macbeth) or “Fear no more the heat o’th’sun” (no Cymbeline). We would not have seen the famous Droueshout engraving of Shakespeare. His work would not have been divided into comedies, histories and tragedies. We would not have known Ben Jonson’s praise of him as a writer “not of an age but for all time”. 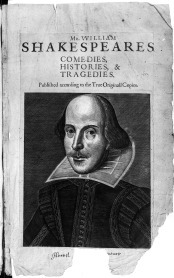 Quite simply, Shakespeare’s reputation in subsequent ages depends on this collection of his work, published posthumously in an ambitious publishing project involving his fellow actors John Heminge and Henry Condell, and the publishing syndicate headed by Edward Blount. Without it, Shakespeare would not be Shakespeare. What’s special about the copy in the Bodleian? While copies of this book are not uncommon, this one is a rarity because it has not been rebound or restored during almost four centuries since it was first received by the library in 1623. Its unique marks of wear connect us with the tastes of early readers, and we can see how their hands have worn the pages of Romeo and Juliet almost to shreds, while leaving King John virtually pristine. Because the volume left the library in the 1660s and was returned after a fundraising campaign to buy it at the turn of the 20th century, it has a particular place in the Bodleian’s more recent history, showing us the affection felt for the library’s collections by many people, and the significance of the Bodleian’s holdings for the cultural life of the nation. The Bodleian received a copy of Shakespeare’s First Folio in 1623, but appears to have sold it at some point in the late 1660s, perhaps having replaced it with the new, improved, edition, the Third Folio, with its additional plays, which was published in 1663/4. The whereabouts of the Bodleian’s copy were unknown until 1905, when an undergraduate at Magdalen College brought a book to a sub-librarian, on duty in the reading room, for advice on its rebinding. Falconer Madan, the sub-librarian, immediately identified the volume as the lost First Folio. Publicity about the find led to the owners, the Turbutt family of Derbyshire, being approached by a bookseller intermediary, offering the huge sum of £3,000 on behalf of an anonymous buyer. The Turbutts offered the Bodleian the chance to match the offer, and thus the first public fund-raising campaign in the library’s history was born. Oxford graduates were approached via their colleges and a letter in The Times newspaper, asking for contributions to buy back the First Folio. But many of the donors were not Oxford graduates. All their letters and cards are preserved in the Library’s archive, and make fascinating reading. Miss Browne begs to be allowed to make a small contribution towards the repurchase for the Bodleian of the Shakespeare Folio, although she has no connection with the university. If you do not disdain small offerings from willing offerers, please find enclosed. Your appeal re 1st Folio Shakespeare has reached me and I think every patriotic Englishman should answer to it. I am only a poor professor with a big family but will subscribe as much as I can afford, viz. £5. Over 80 subscribers pledged the money required, the last donations arriving in the nick of time. Their average donation was around one guinea (the equivalent of about £60 today). It was widely rumoured that the anonymous buyer was American. Only later was it revealed that he was the chairman of Standard Oil, Henry Clay Folger, who already owned 23 copies of the First Folio and would go on to buy over 50 more – but not this one. Having lost its First Folio once, the Bodleian was determined not to lose it again. Thanks to you, we have raised the money to conserve this prodigal book for the future, and bring it, in digital form, to the world now. Find out more about the Bodleian’s First Folio, a highlight in the recent Treasures of the Bodleian exhibition, from Dr Emma Smith. Over the last 106 years, the First Folio has occasionally been photographed by experts at the Bodleian Libraries, and, before that, by Oxford University Press. Imaging Services have kindly digitized negatives of these photographs, dating from the 1930s to the 1970s, for the Sprint for Shakespeare campaign. Bacon wrote the thirty-six plays in the First Folio, Shakespeare did not. > clues, which make his doublet spell out . . . .
> just too characteristic of Bacon’s fine wit. Which link is it that doesn’t work? Thanks for letting us know, and sorry it wasn’t working. I’ve mended the link, and it should work for you now. Please could consideration be given to the following points in relation to the accuracy of the above story. Gladwin M. R. Turbutt was already a graduate when he took the ‘Turbutt Shakespeare’ into the Bodleian Library on 23 January 1905. He had graduated in 1904, according to several sourrces, and Madan refers to him in the Madan, Turbutt, Gibson monograph as Mr. G. M. R. Turbutt, B..A. of Magdalen College. And actually it was for advice on whether anything should be done to the volume in respect of the damage. The Turbutt family had already not acted on the recommendation from another major English library to simply rebind it. Secondly, the librarian he approached did indeed have the title ‘sub-librarian’, but there was only one sub-librarian, being the then-name for the deputy chief librarian, that is Falconer Madan. Madan wrote in the above mentioned monograph: [Turbutt] brought up to me at the Bodleian … . Thirdly, it was only when Madan consulted with Gibson, and specifically on the binding of the Turbutt First Folio, that the conclusion could be drawn that it was the original Bodleian copy. As the 100th anniversary of Lieut. G. M. R. Turbutt being killed in action fast approaches, I think it would be fitting to have these points noted. Thank you.